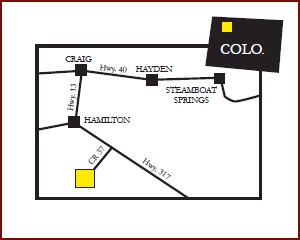 The Elk Ranch is located in northwest Colorado in Unit 12. The ranch sets between Craig and Meeker, Colorado. And is only one hour west of Steamboat Springs. 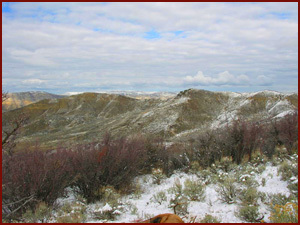 It is also less than 30 miles from the Flat Top Wilderness area, which is home to the largest herd of elk in the state. The terrain is covered with sage, thick patches of oak brush and dense aspen groves. The Elk Ranch is surrounded by private land on all sides. We have large alfalfa fields on the lower elevations of the ranch. The ranch ranges from 6500 ft to over 9500 ft in elevation. Our main lodge is over 4,000 sq ft and is perfect for entertaining our guests. 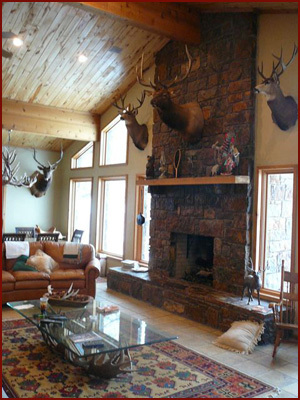 We have a large fireplace that is perfect for setting around and talking about the days hunts. We have a big screen TV with DirecTV satellite. Next to the main lodge is our heated barn with full size walk in cooler. Lower Cabin: The lower cabin is over 1500 sq ft and has two full bathrooms. It also has a small kitchen and frig. The lower cabin is next to the main lodge. Upper Cabin: The upper cabin is over 3 miles up into the ranch. The cabin is 1500 sq ft. It has a full bathroom, electricity, cooking stove and stove for heat. This cabin is perfect for just walking out the front door and start hunting. We now hunt whitetail deer, turkey and hogs in Texas and Oklahoma. We have 2,000 acres of private land in Oklahoma. This ranch holds lots of big bucks. TEXAS: We have 3,000 acres in Texas. This ranch borders the Colorado River. You will see tons of deer each day on this ranch. We have rut hunts open for this season. Limited spots.